NEW YORK—Police are assigning additional officers to patrol Times Square at Wednesday’s New Year’s Eve celebration, in anticipation of protesters who plan to demonstrate against police brutality there. A group called Stop Mass Incarceration Network has organized on social media to protest against the deaths of Michael Brown and Eric Garner, two unarmed black men who were killed by white police officers this year. They plan to gather at Times Square beginning at 9 a.m. Wednesday, until the New Year’s ball drops at midnight. Our policing philosophy is going to remain consistent. At a press conference on Tuesday, the city’s police department said they will continue to allow protesters to demonstrate, and will deploy additional personnel to the area in the event that protesters show up. But O’Neill noted that the viewing areas near the stage usually fill up with people quickly, and protesters will not be let in after maximum occupancy is reached. Over a million people gather at Times Square to watch the New Year’s Eve celebration every year, according to the police. Thousands of cops, both uniformed and disguised in civilian clothes, will patrol the Times Square area and other parts of the city on Wednesday—by air, water, on the ground, and in the subways. Asked whether the department is particularly concerned for officers’ safety after two of them were shot and killed in Brooklyn last weekend, O’Neill admitted that officers are on high alert this year. “This [shootings] is something in real recent memory. 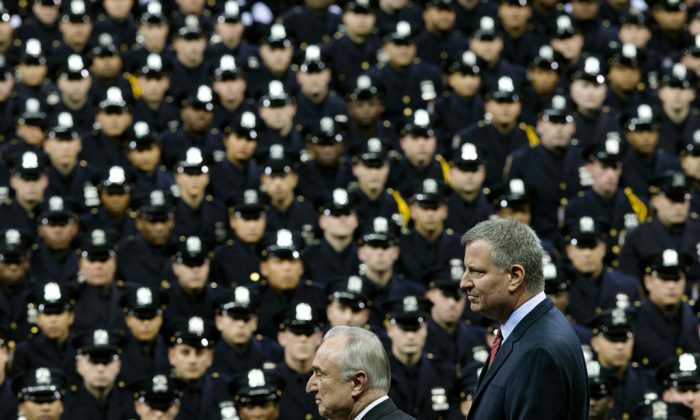 It’s something that every cop in New York City is concerned about,” he said.